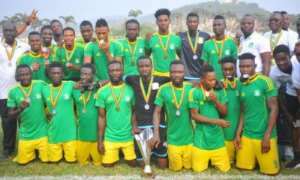 Ghana's representative in the CAF Champions League, Aduana Stars have reached the final qualifying round of the after beating Libyan side Al Tahaddy 2-0 in Dormaa on Wednesday. The Ghana Premier League champions progressed to the next stage with a 2-1 aggregate after a slim 1-0 defeat in Egypt in the first leg. Elvis Opoku and Derrick Sassraku scored in the second half to ensured the Fire Boys overturn the deficit. This is the first time Aduana Stars have scaled the first round hurdle in CAF Champions League qualifiers after suffering elimination at the hands of Moroccan side Raja Casablanca.